THIS UNIQUE GARMENT IN STOCK NOW! One of our hottest styles in one of our warmest colors! 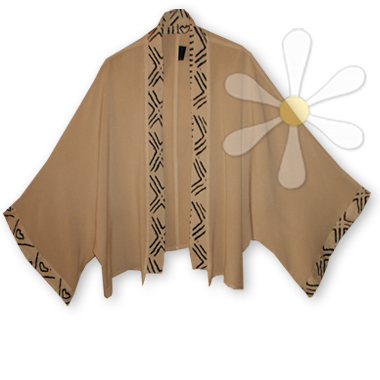 The mudcloth print bands are just one of the many treasures of this deliriously soft authentic Moroccan susti kimono... It's woven by hand in Morocco, the YUMMIEST cotton/rayon susti (susdi) -- I call it the cashmere of cottons -- if you're unfamiliar with this heavenly fabric, you just can't know what you're missing!